Die Reihe. Contributions to auditory art and culture presents the German composer Andrea Neumann with her work “Solo for Zither, Heartbeat and Mixer”. Sounds of the performer’s live-amplified heartbeat trigger no-input-mixer feedbacks. The body/machine mix of pulses blend together with fragile chords and dense drones from the zither. The performer is at the same time experimental test object and investigator: Feeding the system with sounds resulting from her autonomous nerve system, the performer simultaneously directs, controls and musicalizes it. die Reihe. 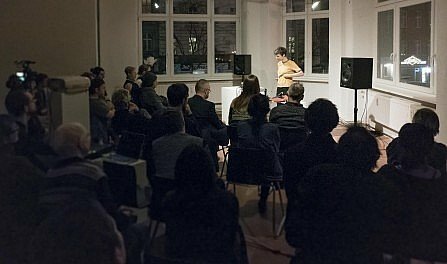 Contributions to auditory art and culture is an event series of the Audio Communication Group at Technical University Berlin and the Master’s program Sound Studies at the Berlin Career College at Berlin University of the Arts.